It’s estimated that there are more than 7 million people across the UK with undiagnosed high blood pressure. High blood pressure is a contributing factor in around half of all strokes, but many people don’t know they have it or realise that it could significantly increase their risk of having a stroke. The Know Your Blood Pressure campaign helps people to understand the link between high blood pressure and stroke, other risk factors and what they can do to reduce their risk of having a stroke. The Know Your Blood Pressure event held at the Flavel Church in Dartmouth on Saturday, 14th April, was part of a national Stroke Association sponsored initiative. In Dartmouth the Rotary Club organised the administration and provided the manpower, with members on the street to explain what was happening and to encourage the public to participate. 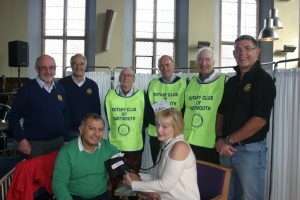 Dartmouth Caring provided the professional expertise needed to undertake the blood pressure monitoring and loaned some of the equipment to run the event. Rotarian Nick Hindmarsh, Manager at Dartmouth Caring, who organised the event, said that despite the town being surprisingly quiet it had been a great success and it had provided a great opportunity to highlight the importance of knowing your blood pressure and how problems can affect people of all ages. The drop-in session was taken up by 46 people. Of those tested, 9 were recommended to seek a medical referral within one month, based on the Stroke Association guidelines. Slightly more women – 52% per cent – than men took up the offer of a free blood pressure check.